The Fountains Vacation Club is a member based program that allows people to buy Fountainshare points that can be converted into weeks at any Fountains resorts. The Club is linked to The Fountains of St. Augustine, which will be the first resort built that is associated with The Fountains Vacation Club. From the beginning, Kidd Group/3W Studios has helped build the clubs brand and sales strategies through the design of brochures, trade show presentations, and a series of websites.The current website features a similar design to The Fountains of St. Augustine with a direct link to The Fountains of St. Augustine, so users can go directly to The Fountains of St. Augustine website. Since The Fountains Vacation Club is the first and only resort club of its kind, Kidd Group/3W Studios believed it was extremely necessary to provide an easy to find Contact Us form so people could request more information. The Contact Us form can be found on the homepage, as well as in the header on all the pages. The website also features a hot link telephone button so those viewing from a mobile phone or with the technology to speak through their computer can do that without having to fill anything out. 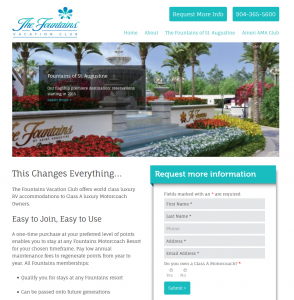 The website was built in WordPress allowing The Fountains Vacation Club to update the site as it progresses.